As part of a series of exclusive interview with equestrian professionals, Dengie catches up with Sandy Phillips International Dressage Judge and member of the Eventing Ground Jury for 2016 Olympic Games. In addition to judging, Sandy is a professional dressage trainer based in the Cotswolds teaching riders from Novice to Grand Prix. In this second part of the interview Sandy talks to Dengie about dressage judging and gives some tips about how to impress the judges and ride a harmonious test. Judging is an incredibly satisfying job, although you don’t generally please everyone all the time! It isn’t paid even at FEI level but it’s about job satisfaction for me. I love to see a harmonious partnership carrying out a beautiful dressage test, it puts a smile on my face. The day usually starts very early on a big international show such as Badminton or Kentucky Rolex. These shows generally have about 80 competitors and the dressage is carried out over 2 days. We are in our judging positions by about 8am together with the person who is writing your comments. And then we get a break every couple of hours and an hour at lunch time. I have to be honest, fair and judge what I see in front of me on the day. Sometimes this can be tough for the competitors as they may have been preparing for this day for months and to get a disappointing dressage mark can put an end to their dreams of getting placed. The dressage element is so important these days for eventing and to win you need to be getting the lowest penalty points as possible. What is most challenging aspect of judging? Remaining consistent throughout the class no matter which combination comes in front of you. I also find it very disappointing to have to give low marks to combinations that haven’t quite got the balance right on the day. It’s disappointing to see potential stars of the future having a “bad day” at the office. What is most rewarding about being a dressage judge? Being able to give higher marks to combinations that have got the balance just right on the day. This enables them to carry out movements with more expression. Getting a personal best makes a rider and a judge very happy! What is a common misconception people have about dressage judges? Many people have the misconception that I am an ogre sitting in a box determined to give them a bad mark! I think every rider that competes should sit in a judge’s box to see what we see. It would certainly make them a better test rider. What is the most valuable thing being a judge has taught you? How we as riders need to ride a test to get the marks. I also think that there are some dressage tests that don’t really help the horse and rider show themselves off to the best of their abilities. I have recently created a 4* dressage test for eventing and this has been submitted to the FEI and I am hoping they will approve it as I think it will really help riders keep their horses in front of the leg and relaxed. It is designed to get the horse moving forwards and if a horse is thinking forwards it will generally get higher marks. As a judge I want to be giving an 8 rather than a 6.5 for movements that should be easy to carry out and this hopefully will be proved when we create dressage tests that flow. Any advice for horse owners on how to make a good first impression when entering into the arena? Come in with a horse that is working energetically, in good balance with a smile on your face! Give us your top 5 tips for riding a dressage test. Take time in your halts. Don’t rush them. Aim for balance and relaxation – they go hand in hand and then everything else will seem effortless! 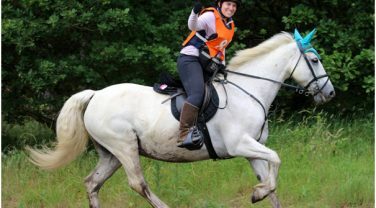 The Sport Endurance ride at Blidworth Forest took place on the 4th and 5th of July, with Dengie sponsoring a number of classes. Around 200 combinations, made up of both competitive and pleasure riders and their horses, took part in the ride, which was run over private farmland and forestry commission woodland.